my family went out to dinner at tree top in waltham (53 prospect street), a little thai restaurant. thai seems to be one of the few rare food that everyone in my family can rally behind. originally i didn't want to go out to dinner but when the magic word "thai" was mentioned, i put on my shoes and was out the door before anyone else could get ready. i forgot what i ordered, some sort of pork curry, three stars (highest hotness ranking). it was excellent, i was the first person to finish my entree, and usually i'm the last person to finish because i'm a notoriously slow eater. the curry wasn't that hot, but because there were a lot of peppercorns, everytime i ate one it made me take notice. afterwards we went to the super 88 market in allston, an asian supermarket that recently opened. i've never been there, but there's been a lot of hype surrounding this new place. when i got there and saw the place for myself, i was pretty amazed. this isn't your daddy's asian supermarket. those supermarkets in chinatown, they're small, they're noisy, and they're dirty. super 88 market is a legitimate supermarket contender, going head to head with the likes of star market and stop & shop. the place is spacious, wide aisles, high ceiling. it's clean, items neatly stacked, easily identifiable, clean meat department, no flies, and even their bathroom was spotless and smelled nice. as for the noise, what a pleasant shopping experience! for whatever reason and i am totally not complaining, they were playing the greatest hits from the 80's. rick astley, a-ha, wham, did they steal my playlist and went out and created a mix tape? i'd shop here just for the music alone, regardless of all the other niceties! what about selection? my parents were thoroughly impressed. they found stuff that they couldn't find anywhere else. i was also very impressed with their large selection of porcelain ware, many imported from japan. i spent a few quiet moments running my fingers over the smooth textures and admiring the glazework. super 88 market isn't just about asian food either, there's a long aisle stocked with more mainstream western food. and it's not just a place for asian people, half of the shoppers i saw were definitely non-asian in composition. asian food is suddenly hip now, as people branch out in their food selection and preparation. i highly recommend super 88 market for your shopping needs, and there's free parking to boot! did i also mention they're opened late, to 11pm? and finally, write your own jokes! i met alex in central square and together we went to the new england aquarium. admission was free because for the month of may, you can get into all sorts of local museums for free if you have a fleet banking card. it was pretty crowded, which was what we were expecting, being that it was a weekend and a lot of families and tourists would be flocking to the aquarium. i haven't been there in a long time, not since they renovated the place. sea turtle: things in the central tank are hard to take photos of because 1) the lighting is very dark and 2) they swim by really fast. so for this turtle, i actually had to track it with the camera. when it saw it coming by, i'd actually follow it with the camera for about a second, until the shutter closed. piranha: they look like normal fish except they have sharp little teeth! big fish: a big fish (4 feet?) i saw in the central tank, i was able to get a good photo because it was just parked in front of the glass, not moving at all. ananconda: kind of hard to see until you realize that log sitting underwater is actually the trunk of a huge snake. shark: the two sharks in the central tank where just swimming to fast to get decent photos of. i had to resort to going to the top of the tank and getting a topview shot. is it just me, or does the aquarium not have a lot of sharks anymore? didn't they use to have a hammerhead shark, or was i just imagining it? sharks are like the rockstars of the aquariums. people come just to see them. electric eel: did you know that electric eels aren't actually eels but are related to catfishes? clown fish: clown fish, a favorite of indoor salt water aquarium tanks! wolf fish: i have first hand experience with these fish, from that time back in august when i went with rob and bunch of guys to go deep sea fishing out in boston harbor. these are nasty looking fish! but good eating, i probably had some in my fish bag mix. starfish: easy macro shot to make, it was right up against the glass, a gimme shot. creme anemone: anemones were also easy to get photos of because they were usually wet lit and they don't move around like fish, other than their tentacles. jellyfish: IF YOU GET THE CHANCE YOU MUST GO SEE THIS! it's just amazing, i want to raise jellyfish of my very own. they look like ghost machines, all transparent and undulating with strobing lights. i could just stare at them all day but there were other people waiting to see them so i didn't want to hog the display. the photo doesn't do it justice! must be seen to be believed! carpet of green anemones: other than jellyfish, i'd also love to raise sea anemones. i overheard someone saying how they resembled sunflowers. 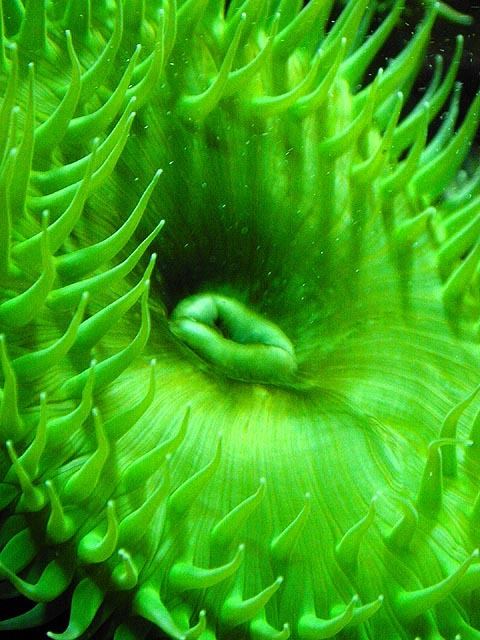 green anemone: it kind of reminds me of my venus flytrap plant. 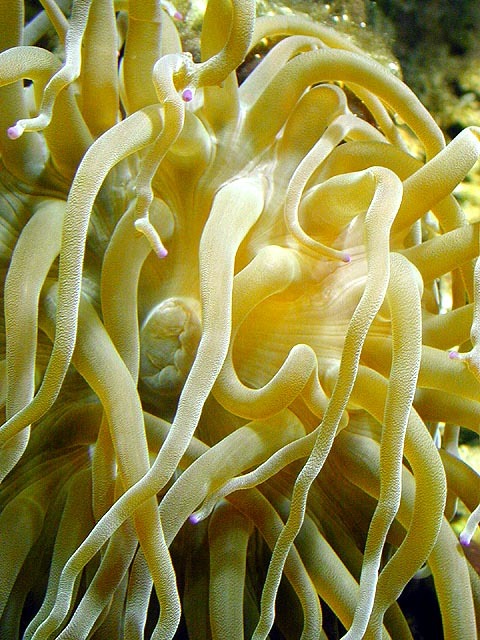 pink anemone: in case you didn't like creme or green...i wonder if they also come in a blue variety? anemones assorted: other than jellyfish, i'd also love to raise sea anemones. i overheard someone saying how they resembled sunflowers, and i totally agree. 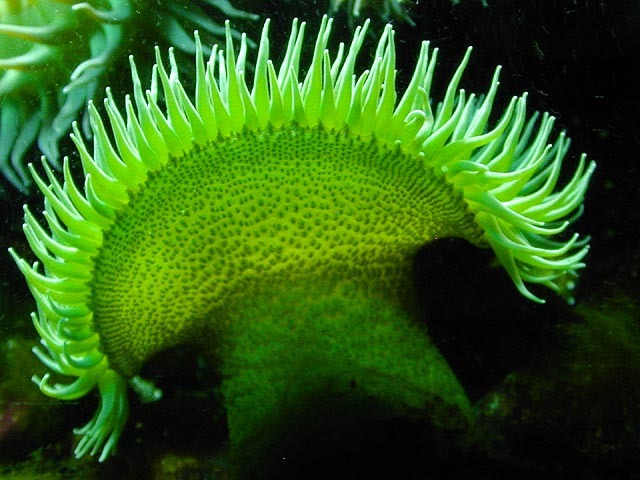 green anemone's mouth: to tell you the truth, it looks kind of obscene... but there's something sort of sensual about anemones, all soft and slow moving underwater, like they're waving. red lobster: what's so special? if you've ever seen a live lobster, they're not red. they only turn red after you cook them, but normally they're this drab greyish crustacean color. there's also a blue lobster but it was hiding. okay, other than the jellyfish and the anemones, my third favorite animal at the aquarium are the poison arrow frogs. they look just like the toys, until they start moving around. from what i saw, they had two spotted green and black frogs, and one blue frog. i probably wouldn't want to have them for pets, because i know they'd escape sooner or later, and i'd be afraid to catch them because i'd be afraid to touch them and get poison all over my hands. and how can you visit the new england aquarium without making a stop at the gift shop? i have a knack for finding inappropriate toys. there was this plastic sea otter for $2.95 that was all dark brown and shaped little a long piece of turd with an otter's face and tapered at the other end. i was so tempted to buy one. there was the phallic shark toy, which i guess it's suppose to be collapsible and pop out of something but i couldn't locate the rest of the toy, just the 10" shark cylinder. and finally, the vibrating seal plush toy, with the ripcord strategically placed to come out of the seal's private area. i went to bed at 2am last night but found myself unable to sleep any later than 9am. so i woke up, watched some saturday morning cartoons (horrible stuff, the shows i had when i was a kid were much better, saturday mornings just aren't the same anymore), and then went into the backyard to take some photos in the bright morning light. i missed it, but my father told me that the anemone flower opened up today. i went out too early, when it hadn't opened yet, and came back home too late, when it had already closed back up. i am eagerly anticipating tomorrow, when i will be home to see it open again. 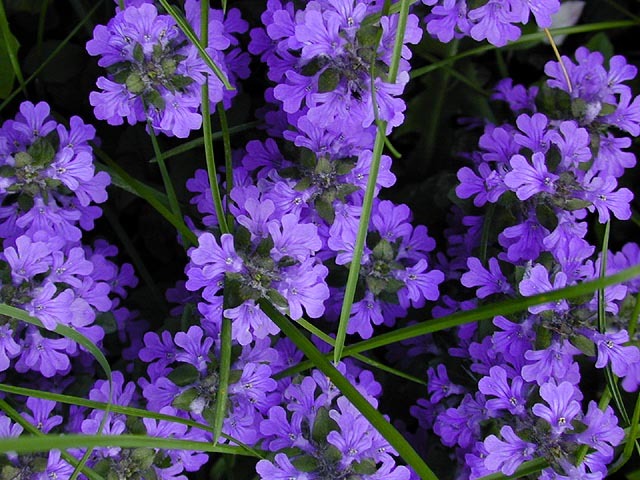 the forecast calls for rain, which is perfect for really dramatic flower photos. i just hope the opening doesn't have anything to do with the sun, and that the flower will reveal itself even if it's overcasted.